Lp(a) is associated with an increased cardiovascular risk. In 1996 researchers discovered a „really bad form” of cholesterol called lipoprotein(a), or Lp(a) for short. This form is not detected in standard blood lipid test but may explain why so many people with normal cholesterol levels have heart attacks. (Cholesterol and triglycerides contain 46 percent and 11 percent of Lp(a), respectively). Because of that Lp(a) has a direct impact on the development of atherosclerosis. Somehow lipoprotein(a) thickens the blood and stiffens artery walls. More precisely, it is able to bind to fibrin clots in the injured arterial endothelium (the innermost lining of arteries) and deliver cholesterol to that region in order to heal the wound. In this way, Lp(a) contributes to the formation of fatty buildups called atheromas and, as a matter of fact, it becomes a component of the arterial plaque. From that perspective, the role of this little-known killer component of cholesterol in atherogenesis can be both long-term - due to its lipoprotein properties, and short-term - due to its fibrin-binding properties. Further, it may cause the sudden and more dangerous development of arterial blood clots. As lipoprotein(a) resembles cholesterol, it is often mistaken for LDL-“bad” cholesterol. And for a good reason. This fatlike globule is one of the stickiest particles in the body. It is a tenfold greater independent risk factor for atherosclerosis than total cholesterol or LDL-”bad” cholesterol. It may be responsible for many of the toxic effects formerly attributed to cholesterol and its LDL subfraction. It may cause the oxidation of LDL and damage the cardiovascular system even more actively in the presence of homocysteine - another risk factor for cardiovascular disease. preeclampsia, pregnancy-induced high blood pressure. Lipoprotein(a) has been also suggested to increase the risk of Alzheimer’s disease and dementia, especially in poststroke dementia – a chronic or persistent deterioration of intellectual function and cognitive skills. Symptoms of dementia include memory loss, personality changes, lack of interest in personal care, impaired reasoning ability, and disorientation. Dietary trans fat and soy proteins may increase the body’s production of Lp(a). People with hypothyroidism (underactive thyroid) have often elevated lipoprotein(a) levels. The close “accomplice” of Lp(a) is apoprotein, called apolipoprotein (a), or Apo(a) for short. The Apo(a)’s biological function is to repair damaged blood vessels. Unfortunately, due to its nature, this adhesive repair protein may contribute to thickening of the arteries and, consequently, to an increased risk of abnormal blood clotting typical in cardiovascular disease. Not the wrongly blamed LDL-“bad” cholesterol then – but the Lp(a) and Apo(a) carried by the Lp(a) throughout the body should be considered responsible for the majority of the detrimental effects on the vascular system. According to new evidence the size of apolipoprotein(a) may be of importance in conveying the Lp(a)-related risk. Specifically, the variation in apo(a) isoform size may lead to increased risk of vascular dementia, Alzheimer’s disease, stroke, or all three of them. (Dementia and Geriatric Cognitive Disorders, 18(2):189-196, 2004). less than 20 mg/dL (in Australia less than 0.24 g/L) is considered "normal"
20 – 30 mg/dL – "borderline-high"
greater than 30 mg/dL is considered "high." less than 10 mg/dL is considered "acceptable"
11 – 24 mg/dL – "borderline-high"
higher than 25 mg/dL is considered "very high." As standard reference ranges differ dangerously, the healthy levels of Lp(a) should be less than 14 mg/dL. So, if you have not checked your lipoprotein(a) yet do it at your next physical checkup. And do not be afraid to ask your doctor for it! Unfortunately, very few physicians ever check for Lp(a). In heart patients, it should be routinely screened. If your Lp(a) level is over 14 mg/dL you need to take action at once. And if you have high lipoprotein(a) and relatively normal LDL-“bad” cholesterol you can probably benefit from lowering LDL as much as possible first. Standard medicine has not discovered any specific drugs to lower Lp(a) yet as it has not had enough attention from medical researchers. However, a drug called Niaspan – approved by the FDA in 1999 for increasing HDL- ”good” cholesterol – has shown to have a positive effect on modifying Lp(a) levels. (Aspirin may mitigate the Lp(a) effect as well). But like other drugs, Niaspan has side effects, not to mention multiple contraindications. Asian Indians - both men and women from India, Pakistan, Sri Lanka and Bangladesh – living in the United States have the highest risk of coronary artery disease. It also starts at an early age, despite the fact that they are lifelong vegetarians or non-vegetarians. Hospitalization rate among Asian Indians is four times higher than Caucasians, Japanese and Filipinos and five times higher than Chinese. central obesity – a sign of insulin resistance syndrome. As a powerful independent risk factor for premature fatty deposition and thrombosis (blood clotting) in the blood vessels, lipoprotein(a) is also responsible for the high failure rate of balloon angioplasty and bypass surgery. 30 percent Asian Indians have Lp(a) levels above 30mg/dL – being at significantly increased risk of coronary artery disease – compared to Caucasians (19 percent) and Mexican Americans (only 8 percent). Nearly 95 percent of lipoprotein(a) is genetically determined (so it runs in families) and adult levels are reached by the first year of life. If either of the parents has a high level of Lp(a) there is a strong probability of their children developing premature coronary artery disease because their Lp(a) levels are identical to that of their parents. Therefore, these children should be screened at the earliest age possible, so prevention could be offered to halt the progress and change the natural course of heart disease. This explains why the disease process starts 15-20 years earlier than when it is caused by conventional risk factors like smoking and hypertension (high blood pressure). It has been said that very little could be done about Lp(a) because its blood concentrations are determined by genetics. However, this statement may be true only from pharmacological point of view. The lipoprotein(a) modification is difficult – but it can be done with targeted nutritional supplementation providing such nutrients as L-Cysteine, nicotinic acid (vitamin B3), tocotrienols (vitamin E), ascorbic acid (vitamin C), and other vital lipid-modulating nutrients and phytonutrients. It was good to talk with you today, and I was very pleased to be able to report favorable results from your Formula. You will recall that my heart problem was a high (and considerably dangerous) level of Lipoprotein(a). A year and a half ago, it was 38 mg/dL. I did, and continue to do, a number of things, including Niaspan, which after 6 months reduced it to a level of 23-24, where it remained for 9 months. Then I began the Formula, and after 3 ½ months the Lp(a) dropped to 18, which is now below the Berkeley HeartLab: good < 20. This is indeed very encouraging. I am enclosing a copy of the Berkeley test results for these periods. And, of course, I plan to continue with the Formula and will let you know the results of future tests. * The testimonial above has been presented as a true story. It has been reviewed by Full of Health; however, it is the sole opinion of the listed individual. So far, we have introduced Triglyceride Reduction Formula™ to our clients and customers in 42 countries: the United States (including Virgin Islands, Hawaii, and Guam), Malaysia, Australia, the United Kingdom, South Africa, Thailand, New Zealand, Germany, Belgium, Trinidad, Mexico, Italy, Spain, Pakistan, Singapore, Mauritius, Suriname (South America), France (including Martinique), Bolivia, Russia, Croatia, Poland, Portugal, Denmark, United Arab Emirates, Brunei Darussalam, Hong Kong, Macau, St. Lucia (West Indies), Norway, Saudi Arabia, Philippines, Brasil, Yemen, Kingdom of Bahrain, Turkey, China, Guatemala, Kuwait, Japan, Taiwan, and Jordan. As blood fats (lipids), are intimately related to what you eat, your diet has a strong impact on the levels of Lp(a) in the blood. For adults, increased blood levels of Lp(a) are almost always a sign of not enough exercise. It is our clinical experience that also anaerobic (flexibility) exercise, such as stretching - an important link between our sedentary life and active life - has a lowering effect on Lp(a) levels; for full health benefits, it can be combined with Y-DAN (aerobic) exercise. At Full of Health, we are sure that this simple method - so simple that, at first, its simplicity probably makes you difficult to believe - will do as much for you, as it has done for our clients and customers. 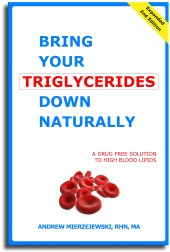 © 2001-2006 Reduce Triglycerides.com: Lowering High Triglycerides Naturally. Triglyceride Reduction TGs Formula™ - A Drug-Free Approach to Elevated Blood Triglycerides. All rights reserved worldwide. This document may not be copied in part or full without express written permission from the publisher. The information on reducing high triglycerides and nutrition provided herein is a general overview on this topic and may not apply to everyone, therefore, it should not be used for diagnosis or treatment of any medical condition. While reasonable effort has been made to ensure the accuracy of the information on reducing high triglycerides, Full of Health, Inc. assumes no responsibility for errors or omissions, or for damages resulting from use of the triglyceride information herein.